Mankind hasn’t colonized other planets yet, but we’re already riding on a grandeur vision of filling the outer space with giant billboards. A Russian startup called StartRocket wants to launch giant orbiting billboards into the empty, black space using constellations of tissue box-sized satellites called CubeSats. Orbiting approximately 280 miles above the ground, these satellites will unfurl Mylar sails about 30 ft. long to catch and reflect sunlight creating a pixelated matrix to display ads, and emergency and event-based messages. The CubeSats will only be visible for about six minutes at a time. Like all futuristic things previously deemed unattainable to Earth’s inhabitants, this one too is expected to run into regulatory hurdles around the globe. The primary regulatory challenge would be whether the CubeSats will interfere with aviation safety. StartRocket will launch the Orbital Display by 2020, and start displaying space ads by 2021. Since the 90s, companies have been exploring ways to send their brands into the stratosphere and beyond. Elon Musk and SpaceX sending a Tesla Roadster into outer space might be one of the most recent examples of space advertising. But it’s been over a decade since we’ve seen an idea as environmentally disruptive as placing CubeSat billboards in space. Surely, the idea of space billboards filling up the night sky hasn't been received with warm approval. If anything, it has raised questions about what belongs in space. The last thing anyone wants to look at across the pristine sky is a big bloated sign of McDonalds or Coca-Cola. 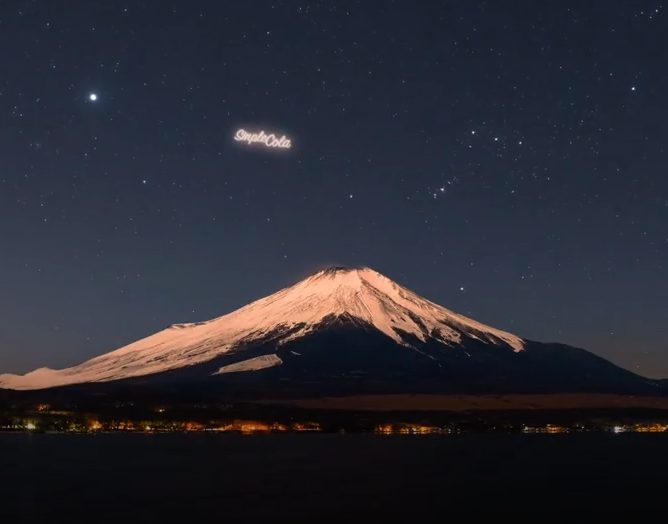 Astronomers and other dark-sky advocates are concerned that these type of aerial advertising will add to the increasing levels of light pollution around the globe. Despite the somewhat cynical reception, StartRocket’s ambition to commercialize the space remains unperturbed. The Russian startup will launch the Orbital Display by 2020, and start displaying space ads by mid-2021. The whole idea of space billboards will only take off if StartRocket gets enough paying clients. The public outcry would make big brands rescind greedy marketing initiatives that blot out stars with giant burgers and soda cans.